Here is a link to my 2-Gun divisions, please feel free to implement them in your own club and report back your experiences with them. I wanted to make some posts explaining the reasoning behind the choices I have made in my divisions in more detail so here goes. I would say the number one foundational key to my view of competitive shooting is the word "practical". The "P" in USPSA stands for practical and originally the founders of the various action shooting sports had practicality in mind. So the first thing I ask myself is; is this practical? However, "practical" - though it seems counter intuitive - is pretty subjective to define. One of the primary reasons I find it difficult or less than obvious to define "practical" in this context is that I believe action shooting sports should not be treated as tactical training. Tactics and shooting are certainly connected so how can shooting be practical without them? Well, my feeling is that a game should be a game, and the only good game is a fair game. Attempts to make the actions and scenarios realistic in a competitive environment result in arbitrary and subjective rules that cannot be equally applied to every competitor at every match. Fairness is often mistaken for accommodation, but they aren't the same thing at all. The goal of game design is to create equal opportunities with objective rules that are simple to apply. In my view it's no different from the US Constitution. The laws, or rules in this case, should be about treating everyone equally rather than forcing people to adhere to arbitrary mandates in order to accommodate the expectations of the game maker. The limits should be on the game maker as much as possible, not the competitor. So the question becomes; what part of competition can and should be practical? I find that much easier to figure out and define clearly. The equipment is number one. Does it make sense or see common use among military, law enforcement and civilian self defense? Number two; are the targets or tasks required of the participant practical? It can be argued that just about any kind of shooting is useful for developing shooting skills and skills are always useful in the real world. This basic idea is shared among all games really. Board games that require critical thinking are useful to build critical thinking skills and those skills are applicable to just about all aspects of life. I'm all about this because I see competitive shooting as an exercise in developing practical skills. However, the targets military, law enforcement and civilians will encounter really only come in one average size. It's also pretty well known at what distances these targets will be engaged, and that they will probably be moving. This brings me to small targets at relatively long pistol distances like 20 or 30 yards, and gimmicky targets like the Texas star. I'm not arguing that the ability to hit them is not a practical skill. I even think they are fun to shoot occasionally. The issue I have with them is that they begin to overshadow more realistic targets and specifically benefit professional gamers. There are none of these trick targets that the pros don't figure out very quickly, and ultimately they are used in place of creative course design. Full-size IPSC paper or steel targets can be made difficult to shoot by obscuring part of them or making them move - both of which represent real world, practical challenges. Essentially, my point is that it isn't the skills which are impractical, but the skill level requirements and often the associated equipment. The equipment and skill requirements are directly correlated and trick targets drive trick, game oriented equipment and shooters. I wholeheartedly support trick shooting, just not when you are looking for at least some level of practicality. There are, and should be, other sports for a variety of shooting types. Aside from the fact that gaming most likely isn't good training no matter how arbitrary you make your rules, I find it just plain annoying when game makers try it. I personally did not come to the match to watch people run a hundred yards, stand around reloading a shotgun, or move a kettle bell from some random position to another for absolutely no reason. Go to the gym if you want to work out. Why are we timing it? Training should be done in a training environment, and a shooting match isn't that. But, going back to "equipment is number one"; it's more complicated than I let on. I am also a big believer that competitive shooting needs to do more to encourage new shooters. While it's a very fast growing sport, those of you who spend much time at club matches will know how many new faces come and ultimately go, never to be seen again. Without a baseline division for participants you automatically create a financial barrier to entry and MultiGun in my view, just doesn't have that necessary baseline. With a financial barrier, you put people at a competitive disadvantage, and ultimately turn them away. And at last THAT brings us to Production division. Get my rule sheet with the link at the top of the post to follow along. Comps/Brakes: Getting rid of comps/brakes was easy. Are they practical? No. Done. I can hear you now. Wait! Yes they are to practical. Fine, let's dig into it. Do they have practical uses? Sure, they reduce recoil and muzzle climb and therefore make shooting easier. That's practical. OK, how do they stack up in the barrier to entry issue? They can be stupid expensive but they don't necessarily break the bank, so what is the balance of cost and useful advantage to the participant? Well the advantage, especially when pared with other modifications, is too great to be considered part of a baseline division. They give the competitor an edge and can be very expensive. Therefore, they're out. Suppressors are extremely practical in the real world, however the financial and technical barrier to entry is obvious. Budget restricted participants will be at a significant disadvantage against others running suppressors. Mag Wells: Another pretty easy one. They were born out of competition, which automatically axes them from a true Production division. However, they aren't entirely impractical. More and more they are seen on carry guns and in the holsters of people protecting our nation. Those are often smaller than the silly things seen in competitive shooting and I feel like trying to invent some kind of size restriction is arbitrary and impossible to boot. Secondly, they don't provide a vast benefit to a budget restricted shooter and just add to the cost to play. Iron Sights: I feel like this is obvious. Next. Optics: This one is actually less obvious while simultaneously being totally obvious. Yeah, that makes no sense. The point of Production (and ok maybe I should change the name to Practical) is not to force people to use totally stripped down equipment. It's to strip out expensive competition driven equipment and allow people to be competitive with practical gear. The bottom line is that optics on a rifle is just a given. In the same way I dislike forcing people to buy equipment just to keep up, I won't force people to ignore widely available and useful equipment just to make life harder. There is a delicate balancing act going on with optics where money might = performance, but the affordable optic field is deep and wide and ever expanding. Irons are difficult enough that they deserve their own division, which is generally the case. More importantly, no one shows up for iron sight divisions and requiring them in my Production division in my view is a death sentence for it. It's a situation where allowing optics does more to level the playing field overall than prohibiting them would. Why have I lumped magnified and non-magnified optics together? Simple. The "Limited" division in USPSA MultiGun or any division that is no different from another save for the optic magnification, in my view, simply doesn't work. If one particular match requires a 400 yard shot and another doesn't have a shot over 100 yards, the non magnified optic is simply at a huge disadvantage one day, and a huge advantage the next day. There is no good solution to this problem and no reason a shooter wouldn't choose the right equipment for the situation in the real world. 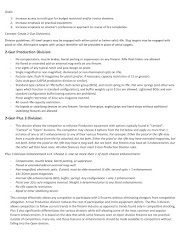 Pistol Magazines: I hate USPSA Production division's 10 round capacity restriction. Magazine extensions are a silly price which in my view outweighs the growing popularity and practicality of them in the real world. But more importantly, that leaves a bunch of people in the middle with ACTUAL factory equipment that came in the box with their pistol. If one guy has 17 rounds and another has 18, there really isn't much advantage. So, flush fitting magazines is a requirement simple enough to enforce and prevents the purchase of ridiculously overpriced equipment in order to be competitive. Duty-Style Gear: OK, maybe a little arbitrary, but USPSA has it covered. This one is simple in my eyes. 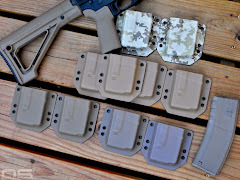 Race holsters are silly, for any occasion. Internal Rifle Mods: Bottom line, the rifle is easily one of the most expensive components of competitive gear and offer substantial advantage to those who have them tricked out for gaming. I left out gas blocks, why? Well, they are really only useful when coupled with lightened bolts and the like. I don't want people to have to mod a gun, or swap parts just to participate when it came from the factory with an adjustable gas block. I also left out triggers. Do they offer an advantage? Sure. Are they expensive? Yup. Will it be easy to enforce a trigger rule? Yeah, it's gonna be pretty damn hard to enforce and not worth the effort. Pistol Weight Restriction: This one is easy. Virtually all of the guns listed on the USPSA NROI list at 32 ounces or less are polymer framed and less expensive. That weeds out the race guns while also creating a clear divide between Production and other divisions. 40 Round Rifle Mags: Maybe a head scratcher for some. In this case, they can provide a significant advantage to someone in say Tactical division but they are practical in the real world in my view, widely available, and inexpensive. Why not take that advantage away from others and level the playing field a little? Bi-Pods: So in this case bi-pods are totally practical and widely used equipment. So we have to go to price. Well, they can be had pretty cheaply. Ok, so how about competitive advantage? Eh, in certain situations yes, in others not really. I think the bottom line here is; I really don't think MultiGun is the place for requiring or even promoting bi-pod use. It's just another expense and weight added to the gun that has limited application that I don't think interests Production division shooters. This is a situation where I think prohibiting them does more to level the playing field than allowing them. Lasers: And I am really debating flashlights as well. Are lasers practical? Yeah, I do believe so. Are they widely used equipment? I'd say yes and no. Honestly, I have no idea how practical they really are and I get the impression that a lot of other folks aren't sure either. However, I believe at this time they are somewhat specialized equipment and they are prohibited in most competitive environments so I err on the side of caution in this case and exclude them. At the end of the day MultiGun is about conventional equipment for the most part, and lasers just don't quite fit in. The potential advantage is significant enough that at the very least, they don't belong in a Production division. I am having such a hard time with flashlights because when I ask myself the test questions, there is a really close balance. They are totally practical, though not necessarily useful in the middle of the day at a local match. So then the weight can actually be a benefit and used for the competitive advantage alone. They are or can be pretty expensive so there might be a budget issue there. But, because they are so widely used in daily life, even budget restricted competitors may own them and a single holster designed to accommodate the light. By prohibiting them I am forcing these guys to buy new stuff. I am leaning toward allowing them because I don't think the competitive advantage is great enough to worry about. In many ways I think it is important that these 2-Gun divisions compete against typical 3-Gun divisions in the same match because it may be possible for someone running off the shelf equipment to place high in the overall standings. Without the shotgun, the playing field gets a serious leveling off. But whether it works to level the field or not, it puts competitors with basic equipment in an entirely different category than the 3-Gun shooters and makes the standings in their own division more important than the overall scores. And there ya have it. If you are thinking about implementing something like this, it may help to understand my logic to compare it to your club's goals. Hopefully they make a lot of sense for you and your participants. Next post will cover the Plus 3 division.